Marine Action Research (MAR) is generating important research on the movements and abundance of marine animals in Zavora Bay, Mozambique, and beyond. The lab’s core research has focused on manta rays, humpback whales, nudibranchs, and artificial reef and wreck colonization through on-land and underwater surveys since its establishment in 2009. In addition to its research capacity, MAR is also a platform for natural scientists, social scientists, university students and engaged naturalists to conduct research and gain experience in fieldwork, and data collection and analysis. The lab is engaged with national and international research institutions conducting research on seahorses, whale sharks, coral reefs, and sea turtles. The internship program at the Zavora Marine Lab combines organized fieldwork and a relaxed mentorship environment. 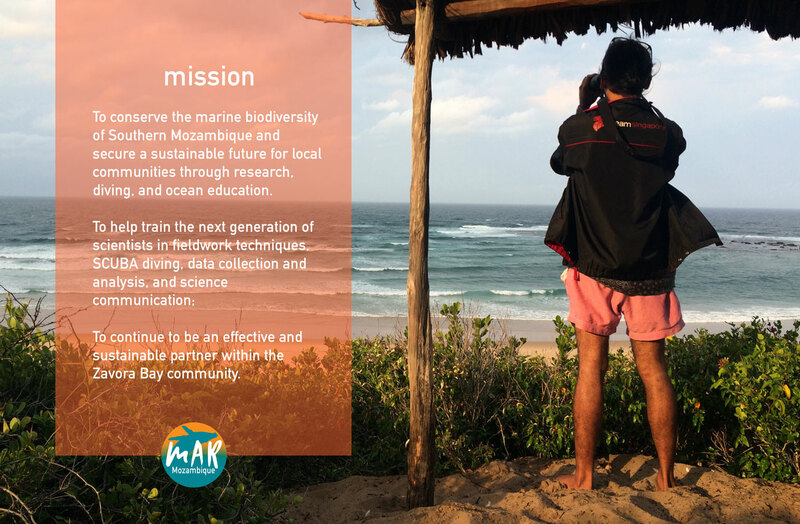 Directors Nakia Cullain and Mornay Delport assumed direction over the lab in 2016 under the name Marine Action Research. MAR’s mission and vision are rooted in an innate respect and appreciation for the natural world and the desire to see oceans prosper under global understanding and stewardship. Mar is the Portuguese word for sea.